Today the temp outside was a chilling 27F. 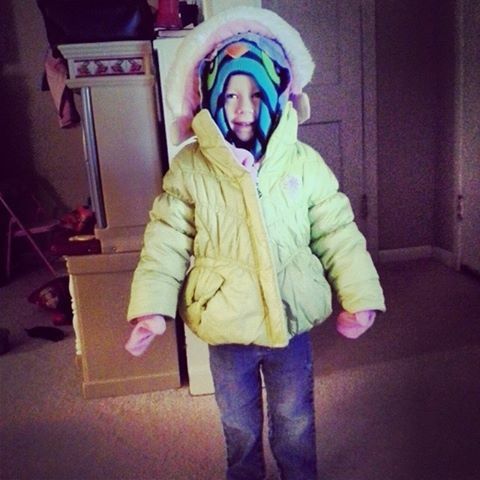 My daughter didn’t want to wear her coat, instead she wanted to wear her jacket. Who wouldn’t want to wear it, it has mermaids on it. She calls it her Bubble Guppies jacket. I happily agreed to put her jacket on her just to refrain from her having a meltdown. I then chased her down and put her coat on her as well. She then wanted her mittens and knitted owl hat to go along with her coat. Though it’s cold out and I want her to dress warmly, I do have an issue in her wearing the bulky winter coat when I have to buckle her into her car seat. I loosen the straps just so I can get her arms through them, then I buckle her in. I try to re-tighten the straps so that they’re snug, but not cutting off circulation. To me, it just seems unsafe. I just need to get her a mile down the road. It’s already hectic getting her into the coat, just to get her out the door. It isn’t even near thinkable taking her coat off of her before I strap her into the car seat. I need to rethink this one over, I thought to myself. While surfing FB I noticed a particular blog link someone had posted. Interesting I thought, as I clicked on it. It was discussing the same issues I was having earlier today. Car seat ponchos or taking the child’s coat off, buckle them into their car seat properly, then have them wear their coat backwards. Hmmm, not a bad idea, but curious how an autistic child with sensory needs would react to this. I’m going to give it a try. This entry was posted in Autism, Blog, My daughter and tagged Autism, autistic children, blogs, Bubble Guppies, car safety, car seat safety, car seats, carseat, child safety, Child safety seat, children, children's clothing, colder weather, Home, Home and Family, Jacket, kids, mermaids, parenting, sensory processing disorder, sensory seeking children, single mom, single parents, the car seat lady, winter coats on November 13, 2013 by JenniferNAdams. 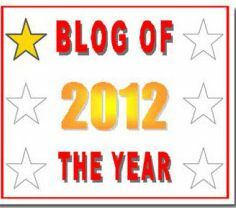 The other blog I received from Marcia http://mmeara.wordpress.com/ I enjoy reading her both of her blogs. She talks about gardening or the latest book that she’s read. Lately she’s been working outside on an Oak tree disaster as a few of her Oak trees had just died. You can also join the Facebook group – click like on the ‘Blog of the Year 2012’ Award Facebook group and then you can share your blog with an even wider audience. Yes – that’s right – there are stars to collect! Unlike other awards which you can only add to your blog once – this award is different. When you begin you will receive the ‘1 star’ award – and every time you are given this award by another blog – you can add another star! There are a total of 6 stars to collect. Which means, you can check out your favorite blogs – and if they have already been given the award by someone else – you can still bestow it on them again and help them to reach the maximum 6 stars! The person that I think deserves this award would be Jae http://litandscribbles.wordpress.com/ She is a writer and an author like me. I have also learned a lot from her in blogging and in writing just from reading her blog or from a few suggestions she’s given me now and then. She’s very creative too; she draws the little characters that you see all over her blog. Click on her link highlighted above there and check her blog out.